I don't think I really have a style. I just make whatever comes to mind. Really, whatever I can get my hands on. I have just recently started working with Polyclay. I really enjoy making my own beads and pendants. I just lost my mom a month ago and also had to move. This put me in a rut for awhile. I just started my creative juices flowing again thanks to the inspirational stories I found here. I woke this morning and it was there! It came to life once I began. I am so very pleased with this set. I thought of my mother the whole time I worked on it. I've been making jewelry for just a year now. I am self taught and I know I still have lots to learn. I was making handmade Christmas ornaments using beads as decorative tassels. My husband thought they were so well put together that I should try my hand at making jewelry. I did, and I have been hooked ever since! In the past few months I have also started making hair accessories. I'd say I do. I have always enjoyed drawing, painting, and making Christmas ornaments. A few years ago I was really into painting nails. Mostly my own nails were my canvas then my friends at work used to come to me to get their nails done. 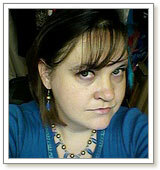 My most popular to do were my "stained glass" look which I have now incorporated into some of my jewelry. I still enjoy drawing, painting, and making Christmas ornaments. I don't do them as much as I use to. Jewelry-making has become my life! A few months ago I joined a beading kit club. I love it! Though I always turn the kits into my own creation. For me making jewelry and watching what I make come to life totally calms me down from a stressful day. I live it, I breath it, I dream it every day! I have had some life changing events recently happen in my life. I am taking my jewelry-making and making hair accessories full-time. I currently set up like a yard sale a few times a week. I also host parties in my home. 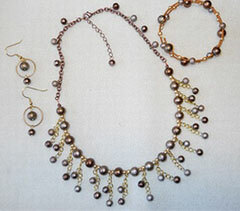 I am also currently working on a website to sell my jewelry and hair accessories. I do have a Facebook page "Trisha Rene's Lovely Things." You can see everything I make there. All my jewelry is one of kind, I don't like repeating myself unless ask to by a customer. I have donated some of my jewelry to our local "Hope Chest" which is a non-profit organization cause I have bought so much jewelry there to rework. This past May I set up to sell my jewelry and hair accessories for our local Race for the Cure and donated half the proceeds. I also give my jewelry as gifts to family and friends and anyone who has bought jewelry from me. I make my jewelry and hair accessories on a very limited budget. I get all my materials on sale or clearance even at my local second hand stores. So don't let low funds stop you! Also I think it's ok to become inspired by something you see, but don't copy it. Go a step or two beyond and make it all your own. I hate going to craft shows and seeing the same thing at every table!